The Washington Department Of Labor & Industries requires all Washington businesses with employees to prominently post a number of labor law posters, covering topics such as the minimum wage, health & safety, and other important labor laws, in the workplace. 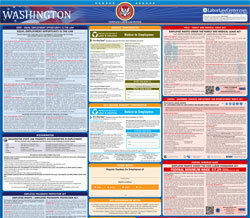 You can download or print all of Washington's mandatory and optional labor law posters on this page, free of charge. All required and optional posters can be either downloaded and printed out at your convenience or ordered from the appropriate organization as listed on this page. The Washington Department Of Labor & Industries requires that all employers post these three mandatory labor law posters in a prominant area within the workplace. Most Washington businesses will also need to post the Federal Department of Labor's mandatory posters in addition to these state posters. Workplace posters are important because they inform workers and employers of their rights and responsibilities. If you're an employer, posting required posters is a legal requirement. Notes: If you have any of the required workplace posters dated 2012 or later you do not need to order new ones. State fund posters are for employers who pay their workers' compensation premiums to L&I. Self-insurance posters are for employers who provide their own workers' compensation coverage to their employees. To see if an employer is currently self-insured, click the employer's name in the complete list of self-insured employers. If you are an employee and remain unsure which poster to choose, please ask your employer for clarification. Bilingual Your Rights as a Worker in Washington State Mandatory information regarding wages and worker's rights in Washington. There are an additional one Washington labor law posters that are either optional, or mandatory only for a certain type of employer. Be sure to check this list carefully to see which posters are relevant to your business. Printed all of your Washington labor law posters? Be sure to check out the free federal labor law posters page to ensure that you comply with Department of Labor mandatory posting laws. Disclaimer: While we do our best to keep this list of Washington labor law postings up to date and complete, we cannot be held liable for errors or omissions. Is a poster on this page missing or out-of-date? Please let us know so we can fix it!